South Coast Generators has a full range of electrical distribution equipment to ensure the power is provided right where you need it. 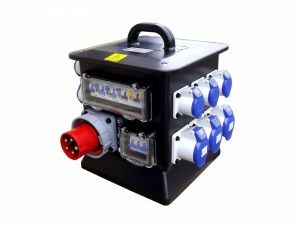 We stock event grade high quality weatherproof distribution boxes in both single and three phase options for temporary reliable, safe power in the harshest conditions. End user distribution boxes are all fitted with RCBO’s on each final circuit. For dual generator installations we can provide Auto Changeover boxes which will change over the generator in the event of a loss of supply. Just give the team a call on 03300 883950 to get the electrical power distribution you require. Quotes are no obligation, simply tell us your requirements and the team will come back to you with a competitive generator hire quote.